The Milton Library Foundation’s (“MLF”) Literary Gala will be held on October 17, 2018 at Granite Links Golf Club. 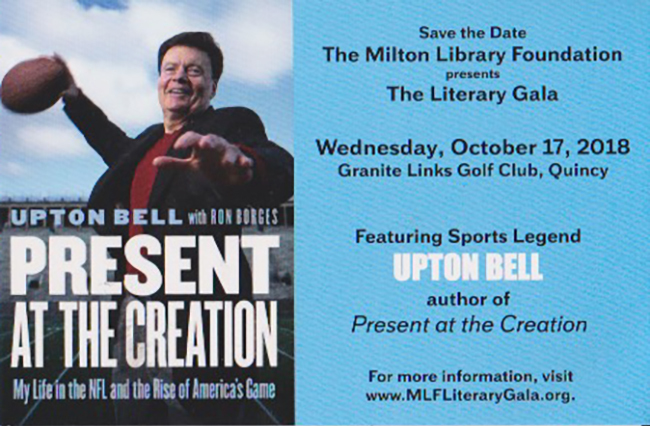 This year, Upton Bell will be speaking about his new book “Present at the Creation: My Life in the NFL and the Rise of America’s Game.” It will be a fun event with great food and great surprises. Fundraising from the MLF’s Literary Gala is essential to our efforts to maintain the Library as an outstanding learning and community resource. What could be better than food, fun, football talk, and supporting the Milton Public Library! Please join by purchasing tickets or, better yet, participating as a Sponsor.